Welcome folks to another matte and miniatures retrospective where we’ll take a trip back to 1967 and look at the wonderful Oscar nominated special visual effects from the WWII action film TOBRUK. However, before we do so, let me say how pleased I am with the feedback I’ve received from all quarters on my last blog article, ISLAND AT THE TOP OF THE WORLD. It seems that a heck of a lot of people really love the film and some even regarded it as instrumental in their getting into the special effects business themselves much later on. I’m sure all readers of this blog have their very own film whereby the proverbial ‘penny dropped’ and a lifelong fascination with cinematic trickery was firmly and deeply rooted. For me it was an early 70’s late night tv showing of KING KONG which sealed the deal, which even though I’d been raised on so many of Ray Harryhausen’s tales of mythology and high adventure, the yearning to actually see KONG in a format other than those bloody wonderful Famous Monsters of Filmland photo spreads was in itself a ‘quest’ finally fulfilled. I had the privilege some time back to proof read and offer my two cents worth on an advance draft of the very, very long overdue memoir of the legendary MGM special effects chief A.Arnold ‘Buddy’ Gillespie, a weighty tome which Gillespie himself had penned in the early sixties but for various reasons never found a publisher….until now! It’s with great pleasure that I’m able to report the publication and availability of The Wizard of MGM - The Memoirs of A.Arnold Gillespie, thanks in no small part to the dedication and hard work of Buddy’s grandson, Robert Welch who has worked tirelessly over the past few years in making this unpublished manuscript a reality. Although I’ve not seen the final edition I can state that based on the early draft I have that this book is a must have for all fans of traditional special effects and trick work. For those unaware of Buddy’s background, he began his marathon career as a draftsman at MGM in the twenties and soon graduated on to art direction under Cedric Gibbons before moving into special effects as assistant to Metro’s head of SFX, British born James Basevi. 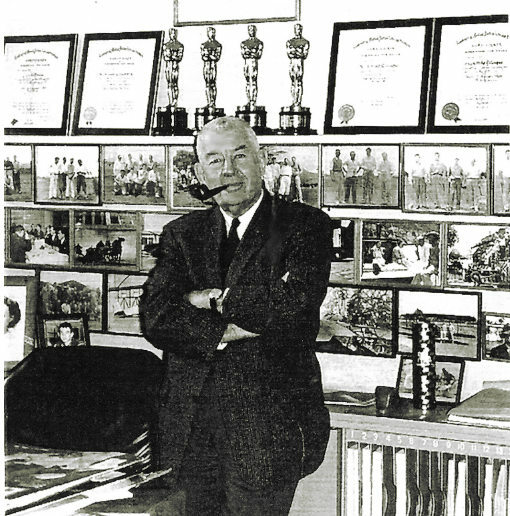 From there Buddy would assist Basevi on many films, eventually taking over the headship when Basevi left MGM, where he would remain until his retirement in the early sixties. The Gillespie catalogue of films is as lengthy as it is impressive, with such noteworthy entries as SAN FRANCISCO, both BEN HUR’s, many TARZAN's, GREEN DOLPHIN STREET, FORBIDDEN PLANET, COMRADE X and THIRTY SECONDS OVER TOKYO (his best in my book) to name but a few. 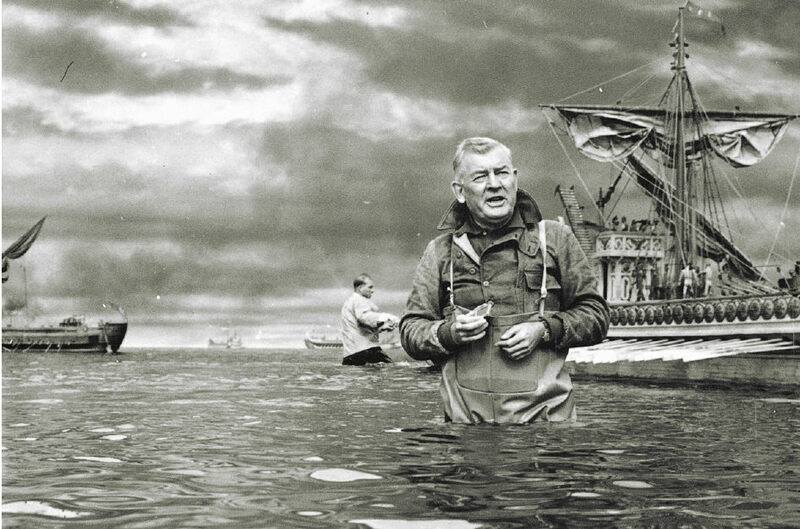 Gillespie was a multiple Academy Award winner and was (and still is) recognised throughout the industry for his ingenuity, broad ranging skills and an innate ability to solve the most head scratching effects problems. Buddy was a true craftsman, and by all accounts, a real gentleman – loved and respected by all, which may account for the lengthy and heartfelt foreword by top shelf Metro stars Spencer Tracy and Katherine Hepburn no less, which is quite wonderful in itself. Among his many areas of expertise, Buddy was probably best known for his astonishing miniature work in literally hundreds of films, and naturally the book covers this specialty in comprehensive and profusely illustrated detail. 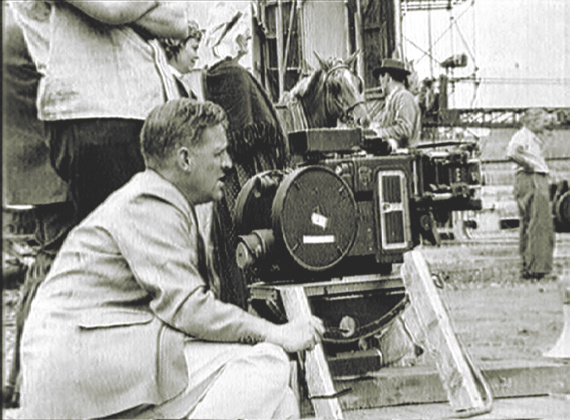 All of his tricks of the trade are brought to the fore, especially on the films mentioned above and the many war films MGM produced. 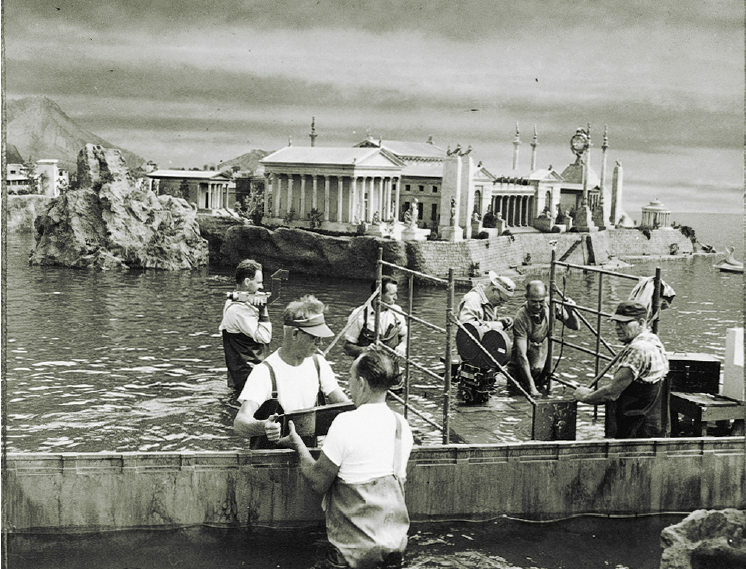 In addition, Gillespie includes a chapter on matte painting at MGM and a profile on his long time associate Warren Newcombe, who was just as instrumental as Buddy in assuring quality control of Metro’s FX output that stood head and shoulders above the rest of the studios. 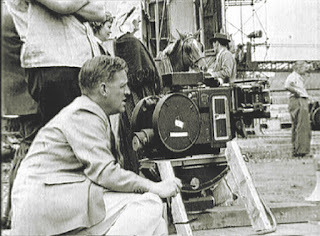 Gillespie is generous in his accounts, with high accolades being shared among his dedicated team of specialists, with miniature maker Donald Jahraus, effects cameraman Max Fabian and photographic effects man Clarence Slifer being singled out as absolute geniuses, without whom, in his own words, Gillespie’s work wouldn’t look half as good up on the screen. The book is loaded with behind the scenes photographs from Buddy’s personal collection, the majority of which have never been seen before. 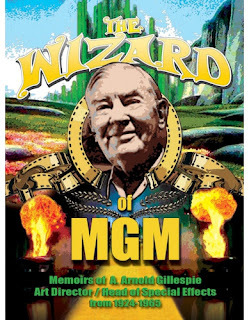 Although penned in a somewhat wordy style as one might encounter from a bygone era, it’s without hesitation that I recommend TheWizard of MGM – The Memoirs of A.Arnold Gillespie to readers of this blog. It’s as much a unique historical document as it is a ‘how to’ manual. Fantastic and essential! While not one of the memorable war pictures of that decade, the 1967 desert actioner has a fair bit going for it with a ton of action, terrific miniature work by Howard and Darryl Anderson and wonderful matte paintings by Albert Whitlock. Couple this with the fact that the film made a ton of money for Universal, they felt the need to remake it just a few years later, complete with most of the action, stunts and effects shots re-used, the formula obviously worked. I first saw this at a Saturday afternoon double feature with, I think, PT 109 with Cliff Robertson at the lovely Mayfair theatre (R.I.P) in suburban Auckland in the early 70’s and loved it. Hell, anything where the good guys swing past Nazi pillbox slots on ropes while heaving in hand grenades with the inevitable ‘ka-boom’ was crowd pleasing at it’s best. I love war films, especially dealing with the Second World War. My own grandfather was in both world wars – he was underage for WWI and faked his age (15) to get in and do his bit for King and country, but the man also pulled a fast one again for the next war whereby he was too old (and was married with children!) so that he go back “and get to finish what I started” in The Great War. He was in North Africa in WWII and fought (and survived) the desert campaigns, so this bit of history is of interest to me, as are my memories of this wonderful man. Rock Hudson heads up the cast of TOBRUK and makes the best of the action oriented scenario under the direction of Arthur Hiller. I always thought Hudson could better himself from all those fluffy lightweight rom-coms, and the astonishingly brilliant John Frankenheimer thriller SECONDS made just the year before that showed a Rock Hudson we’d never seen before – and sadly would never see again….but what a performance, and one hell of a film! Of interest, Frankenheimer, among his many great films such as the riveting SEVEN DAYS IN MAY (an all time fave for me) directed a superb WWII picture of his own, THE TRAIN, starring Burt Lancaster. Albert Whitlock sets up an original negative matte shot. The TOBRUK effects work is great. A number of excellent Al Whitlock painted mattes are utilised, with a few expansive panning matte shots which encompass vast companies of Rommel’s tanks at the ready – all painted. Many of Whitlock’s mattes are recycled for the remake/sequel RAID ON ROMMEL (1971) and are curiously all optically ‘flopped’, probably in some bizarre effort to disguise them(!) Several painted mattes and live action are combined with travelling mattes to good effect. The film really stands it’s ground in it’s superior miniature battle sequences which occupy the majority of the latter part of the film. Beautifully staged and photographed miniature work with surprisingly effective scaled down pyro effects for the time, which isn't always the case in films of this vintage. All round excellent model work by a regrettably uncredited Howard Anderson and his effects company, and I must compliment them on their cinematography here, with depth of field – normally a problem – being spot on and believable. Veteran mechanical effects expert Fred Knoth handled the full scale destruction here and would hit bullseye a year later with his death defying pyro work in John Wayne's oil well firefighter picture THE HELLFIGHTERS. The sad part is that although TOBRUK was up for the Oscar in best visual effects, but inexplicably lost out to the atrocious DOCTOR DOOLITTLE that year… but don’t get me started on bloody Oscar injustices! I can't confirm it, though I'm fairly sure this is a Whitlock shot with much of the scene painted. A nicely subtle matte painting, augmented with a pan from left to right. Whitlock was known in the industry as Universal's secret weapon. Even a modest budget such as was the case with TOBRUK could be made to look spectacular by way of Al's paintbrush and effects savvy. An extremely wide pan across a sprawling Whitlock matte shot is a great reveal for Rommel's ominous war machine. A closer view of the same matte. Universal's long time (and I do mean long!) VFX cinematographer Ross Hoffman tied the painted and live action elements together beautifully with a smooth and unobtrusive matte camera move. If ever there was a technician who was never properly recognised for his skills and contributions to hundreds of Universal pictures dating as far back as THE INVISIBLE MAN, it would be Ross Hoffman. One of several back to back mattes in the one sequence. This and several others would be re-used, albeit 'flopped' to look fresh, in the 1971 Henry Hathaway remake titles RAID ON ROMMELL with Richard Burton. Albert Whitlock shot where all is painted except the roadway and trucks. Even the foreground rocks are painted. Art director's detailed drawing of the German's fuel dump which would form the central action set piece. This is a preparatory drawing for an FX matte shot, the result of which may be seen below. The German's fuel depot as seen on screen. This is a split screen matte shot with the join running horizontally across the shot. Although it may be a miniature comp, as one was built for the explosive climax, I tend to think this is an Albert Whitlock matte painting as matching up of posts and other details would have been easier with matte art from scratch rather than lining up such as miniature to live action. A superbly rendered and authentic looking scene of destruction courtesy of Albert Whitlock. The town under bombardment. A Whitlock painting with overlays of animated searchlights, muzzle flashes and smoke. From the same sequence, with the actors matted into the foreground. Now, this is curious. I've seen this exact FX shot in several 60's films, most notably the British film OPERATION CROSSBOW (1965) with effects by Tom Howard, and I think it showed up again in ESCAPE OF THE BIRDMEN in 1971 - another Whitlock picture. 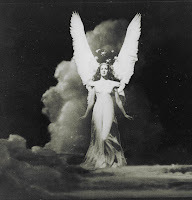 Nothing unusual here though as Warner Bros and MGM used to recycle good FX shots ad nauseum in successive films, with several Warner's Errol Flynn war films having identical miniature shots time and time again. The fleet off the coast. The shot appears to be a full FX shot and it looks as if the waves are a gag of some sort. Let the mayhem begin. Some of Howard Anderson's excellent miniature work. Surprisingly good scaling of the model pyro work. Shooting it all outdoors and day for night didn't hurt either. Many a model shot has over time been ruined by artificial light and poor focal depth (see THE TIME MACHINE for appalling work). Setting up the miniatures with Howard Anderson shown at right with puppet of German soldier. The huge fuel tank ruptures. Again, terrific miniature work. I don't know what frame rate was utilised but the high speed photography gives the correct grandeur to the film. You could be forgiven in thinking this is a Derek Meddings shot, as it does look that good! Good sound effects and film editing adds much to these sequences. A close look at part of the miniature set between takes. Extras matted into the miniature plate via travelling matte. As a kid this sort of big screen Scope action was mindblowing, and we'd try to recreate it later with model trains, trucks and stuff and homemade turpentine squibs which never looked as good...and very nearly burned the house down! 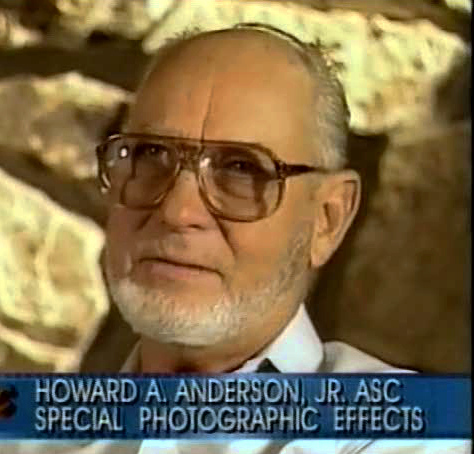 A production still taken during the Anderson conflagration effects shoot. Optical combo miniature pyro and actor works better than you'd think. All miniature, though you'd never know it. For a 12 year old boy, this was better than Disneyland. Hudson and pals to the rescue. Blue screen composite that looks sensational. Miniature and live action travelling matte combo. It all ends with one hell of a bang! Travelling matte composite shot. Soon: The Sky's The Limit - The Artistry of the Matte Painted Sky. And: Harrison Ellenshaw talks candidly about his career and the influences of Peter & Pop. Nice one this one, although there are other movies in Whitlock's career, that should have better deserved an Oscar nomination. I'm talking about films like "Mac Arthur", "Torn Curtain" or "History of The World". But that's just my opinion and as you've said don’t get started on Oscar injustices. Nevertheless a nice new entry which reminds me to watch that movie again some time. Another great write-up Pete! Tobruk is on my list of awaited DVDs - it's not available here in Canada. Now I'm keener than ever to see it. 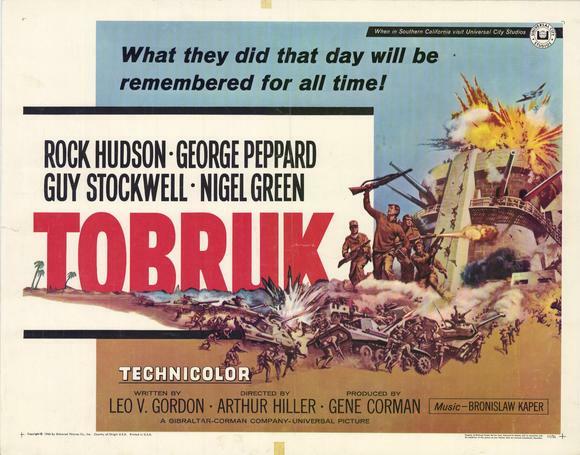 TOBRUK is available from Amazon in a nice, crisp anamorphic scope transfer, unlike the earlier awful pan & scan edition which lost much from the sides of the frame. By no means a 'great' film, but an enjoyable and firey action show it is. On the wonderful book THE WIZARD OF MGM, the book (based upon the draft edition that I have) is jam packed with hundreds of b&w photos and frame blow ups, though mostly the former, showing lots of miniature sets and before and after shots from films you'd never suspect as having miniatures and trick shots, such as Valley of Decision with its vast miniature townships and mills all beautifully tied in with matte art for expansive panning shots. Lots of material on Ben Hur and very detailed text on scale, camera speeds, process shots - and the integration of all of the above in single shots for films such as Tarzan and Green Dolphin Street and more. Some great behind the scenes material on Clarence Slifer and his amazing aerial image matte comp methods. Some stuff in there too on Matt Yuricich (whom Gillespie had the highest regard for). As I mentioned, it is a little 'wordy' but is a very thorough, detailed and an absolute gold mine of info for those who love this old hand made wizardry. It's everything that the recent book on the Lydecker brothers WASN'T (that was very, very poorly written and looked a real rush job to me). Buy it Thomas.... I know you'll love it. Unfortunately the distributor doesn't seem to sell the books outside the US. And I don't read pdf-files. Maybe I have to wait, till it appears on Amazon.com. If ever. I have relayed your concerns to Gillespie's grandson, and will update you here when I hear back. Certainly not a good situation, I agree - and not uncommon for US based companies, some of whom simply don't know that there is a whole WORLD out there beyond their own borders. On PDF - I couldn't agree more. Impossible to read those damned things. According to the editor, the book is supposed to be for sale online and should be shipped anywhere internationally, though he will look further into the complaints. It WILL be available on Amazon soon ("not soon enough" says the editor) so stick it out till then is my recommendation.... it is worth it. Unfortunately our Amazon Canada doesn't carry it, only the VHS, and for big bucks. I see it there on Amazon UK, and for a good price too - darn! I'm sure it will be available here soon enough though - the remastering of film elements had to be done for the DVD, and as I understand, that's the investment bit. I'll have to look for that book too, thanks for the tip. 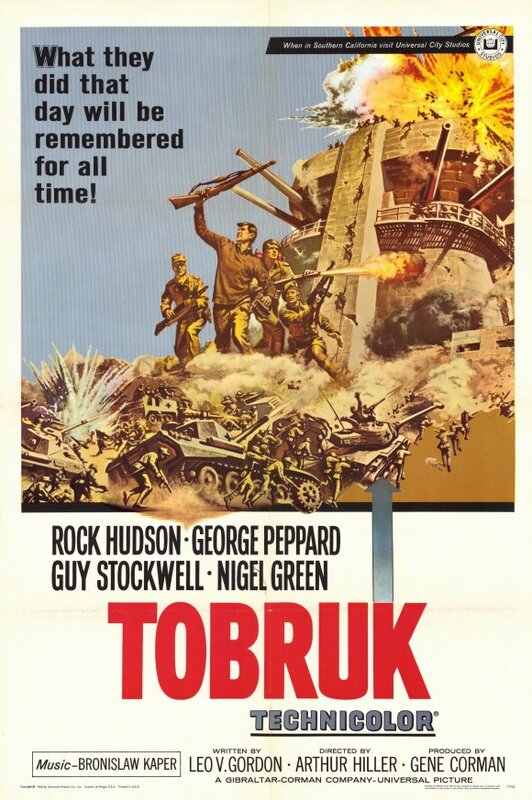 TOBRUK is readily available on region 1 from Amazon USA, which is where I got it from. Problem solved. Wow, so it is! Thanks! I'll be ordering that once I'm clear of Christmas, provided they'll ship to me. Yeah, those bastards! As fast as I delete 'em more appear, but at least the sheer incompetence of the so-called messages which all look like they are penned by the same nitwit somewhere in China or Romania with a pocket dictionary and a very bad sense of prose. Laughable! By the way - the book THE WIZARD OF MGM is now available on Amazon - which is a relief as the current distributor doesn't ship anywhere but the good ole' US of A. A hell of a way to run a railroad.